Just when I thought spring was about to start and warm weather was here for good, rain came into the forecast and I was bringing out the Hunter boots again. We were in the Folsom area trying a brunch place for the first time when I noticed the pretty flowers and cute little shops in the area. I just had to take pictures with the flowers! They made the perfect spring photo backdrop. 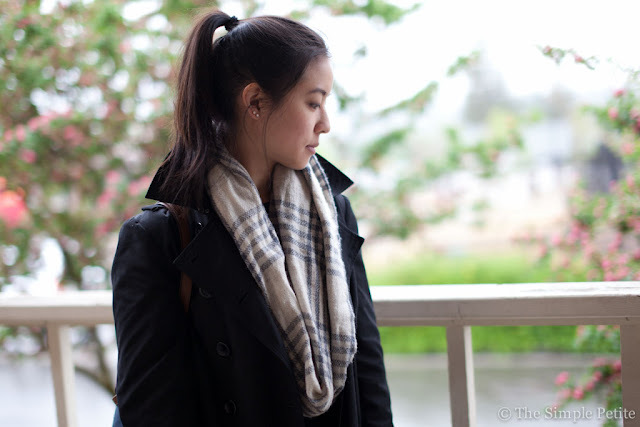 I really like this scarf - it's a great neutral scarf. Unfortunately, I got it at a cash and carry show during the holidays two years ago so I can't link it and couldn't find one just like it. 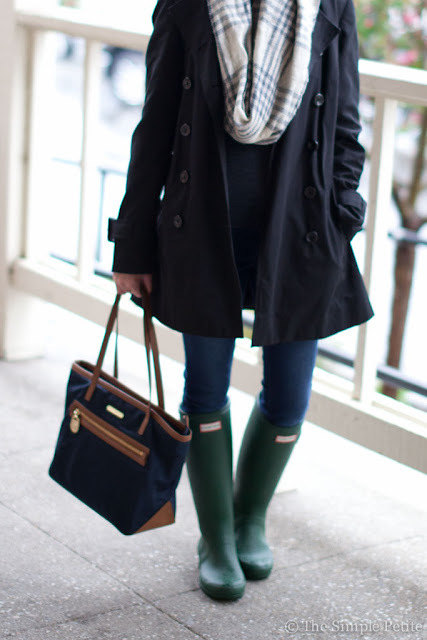 However, I highly recommend having a scarf that's neutral that goes with many outfits! A scarf doesn't have to be bold and make the outfit pop. It can be safe and neutral. Unfortunately my purse is also old too. It's a Michael Kors Kempton Nylon Tote, like a mix of a Longchamp and a MK Tote. It fits a good amount, a standard medium sized tote, not too small but not too big. I use it to carry around a camera, essentials, and maybe my Hydro Flask water bottle. I can easily fit a DSLR camera in here which is why I've been using it a little more often. I also love that it has a zipper at the top to conceal the contents. If you're interested in a similar style with two front pockets instead, Michael Kors' new Kempton Tote for this year can be found here and is currently on sale for $89! 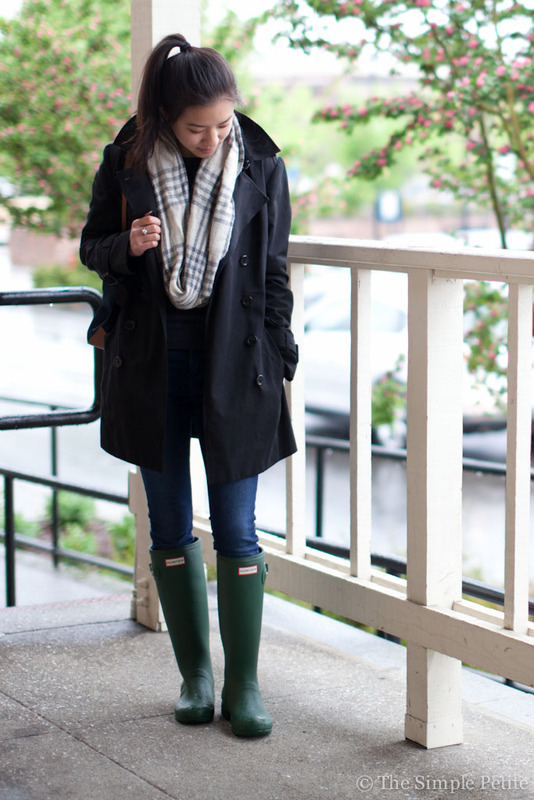 Onto the Hunters, I'm still loving the freeness of rain boots, as in I love not having to worry about puddles or heavy rain which I love. I do notice they're not great to drive in though. If I drive with them on, the rim of the boot catches on the edge of my seat when I move my leg back and forth from accelerator to brake so I've been keeping an extra pair of shoes in the car to drive with. But outside of that, I'm glad I splurged for them. 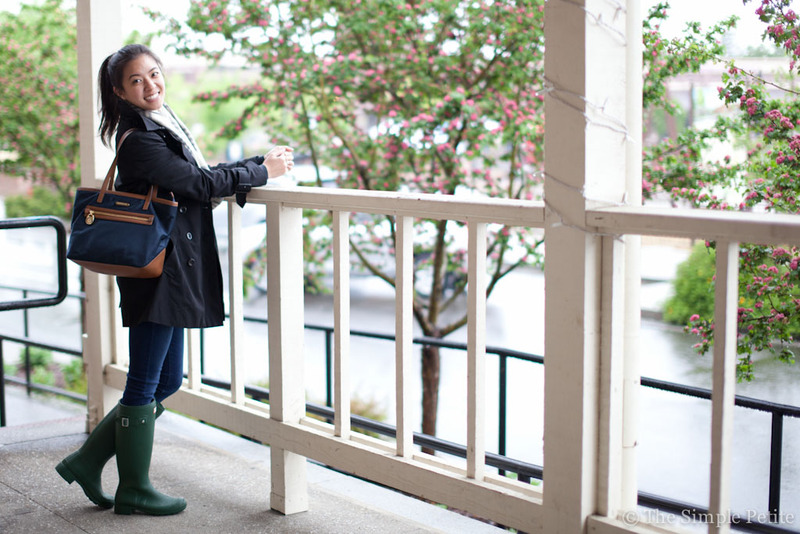 On the other hand, I'm so ready to put the boots and trench away and for the real spring weather to come. I can't wait for it to get warmer around here!